Doux Reviews: Sunday Discussion: What if Supernatural never ends? Sunday Discussion: What if Supernatural never ends? My god, they're just babies! Supernatural is an undeniably great show. I've loved it nearly since the beginning, and it will probably end up near the top of my list of favorite series ever. And I get why they keep renewing it. The quality continues to be excellent, Jensen Ackles and Jared Padalecki have amazing acting chemistry together and they're still in their thirties, and the ratings keep improving as new viewers keep discovering it. Part of me is thrilled that one of my absolute favorites ever is about to start its eleventh season. The other part of me thinks the show should have ended when it was at its most innovative, which many would argue was at the end of the massive arc story in season five. And yet, I would have been totally devastated if it had ended then. Devastated. Much like I would have been had Buffy the Vampire Slayer ended with season five. Do you think Supernatural should have ended already? If so, when? If not, why not? If the ratings continue to be good and the head of The CW loves the show (I hear he does), what will it take to end it? Will Jensen and Jared simply have to call a halt themselves? Do you think they'll ever come up with a spinoff that works? What could it be? And finally, for you Supernatural virgins: does the fact that it's so massive keep you from trying it? Okay, I'll start. I love the show too and I'm sure I'll watch it to the end because it's still good, but I become less enthused every season. No matter how good something is, it eventually wears out its welcome. Watched season one and two and then gave up. The many seasons do scare me from trying again. There's so many revivals now-X-Files, Twin Peaks and even Prison Break. I think enough is enough, and you can't go back. I wouldn't even want a new Firefly series-because it's been too long since it ended. Funny that you ask this Billie, because I have spent last night marathoning through season 9. Personally I still like the show, even though I don´t like some of the arcs form seasons seven and eight. As for your questions, I think for the sake of the show a great end could have been in season 5, but for my own personal sake, I´m happy that they are still going. Although it could be good for the actors to end it now and to do something else. Spinoff? No, it is not mean to be. Do you think Supernatural should have ended already? If so, when? If not, why not? I don't think it should have ended already. Although I'm not happy with the Carver era of writing, a lot of people continue to watch. My view is that if enough people enjoy any show enough to take an hour out of their lives to watch it, it deserves to continue. If the ratings continue to be good and the head of The CW loves the show (I hear he does), what will it take to end it? Will Jensen and Jared simply have to call a halt themselves? If the ratings hold, it will take Jensen and Jared calling it quits to end the show. The show has survived turnovers in show runners and writers. The one thing that is Supernatural is Sam and Dean. As long as they are willing to do the show, if the ratings hold, it will go on. Do you think they'll ever come up with a spinoff that works? What could it be? I think they could come up with a workable spinoff, but the CW would have to think outside their preconceived notions. I really think a Jody/Donna teaching Alex/Claire to live in both the world of the supernatural and the mundane world would be a workable and enjoyable series. However, the CW would have to decide that a series featuring a couple of women who are over 25 can helm a series. I don't know if the CW will actually make that leap, but I do think the idea could work. mazephoenix, if you're ever inspired to try again, seasons three through five are just excellent, and the end of five is a reasonable stopping point. Cecile, you don't have to apologize for posting anonymously. We love all comments! Percysowner, I loved Jody and Donna as a team, too. But you're absolutely right that The CW would never center a show around two women who aren't sirens in their twenties. Every story should bow out at it's highest stakes or maintain it's peak. unfortunately supernatural could do neither after s5 and the obsessive loyal viewers are stuck with it on the downhill. @Anonymous I actually really liked season six, so ending at five wasn't necessary for me. Season seven had real potential, although it fell flat, if only because SG couldn't fulfill her vision. Eight, nine and ten have been problematic for me. In the end, I have to say that I am not the be all and end all for judging a show's quality. I still believe that if enough people like Supernatural to keep the ratings up, it must be doing something right and it should continue, as long as the participants (in this case the Js) are happy with staying around. I love Supernatural. I think, someday, it will reach a comfortably satisfying organic ending. MASH did that. If you notice, when the endings are kind of forced, they really do not work. Their loyal audience is left with that 'What the heck just happened?'. As an example I think "Battlestar Galactica" ended that way. 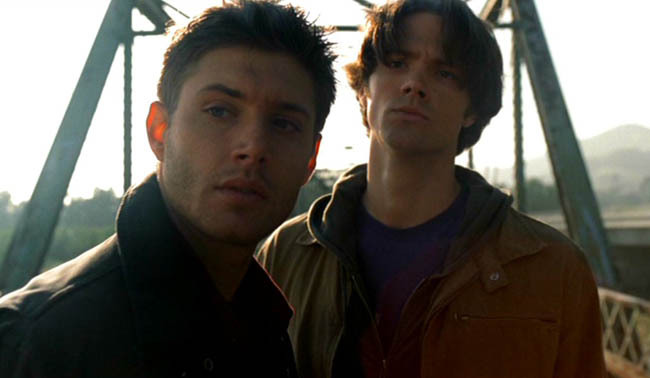 As for a sin-off, the only one I could see working is some sort of "Sam and Dean, the Early Years". It would be so difficult to replicate Jensen and Jared's chemistry I can't see that happening but I'd sure give it a fair chance! If Supernatural had ended after Season 5, we wouldn't have had "The French Mistake", or the absolutely fantastic 100th episode just this past season. We wouldn't have gotten to really know Jody Mills or Charlie or Kevin. It's true, some seasonal arcs have been better than others. But the beats that make up all those arcs have still contained such collective mythology, charm, creativity, innovation, and just sheer love of the characters and their stories, that it's worth it. I mean, we wouldn't have had that moment at the end of the 100th episode when we all collectively went, "Chuck!!". I'm glad we got that. In terms of spin off, I agree with one of the Anonymous posters, that an "early years" premise could work. As much as I love the supporting characters, I would always be waiting for Sam and Dean to show up. I truly believe that the show should have ended at the end of season five. Why? because it wrapped the story up nicely with Family is the most important. Now that its on season 11 we continue to see the same problems. Yes we have gotten some new characters, but we also lost a lot of great characters. I will watch the show until the end, but I didn't really like season 10 all that well. I think I was so excited that at the end of season 9 Dean was teased to be a Demon, and then we got to see him in two episodes as a Demon. That is like them teasing Lucifer in season four and him being in two episodes in season 5. Can they still go on? yes, Are they over doing the show, yes. Jensen and Jared will stop eventually and then the show will be over. I always think about it like this. If you have seen breaking bad you will notice they have a plan, they told there story from the beginning to the end. In my opinion Breaking Bad was one of the best shows because they knew what they were doing, how long they were going to do it for, and they didn't force more story when there wasn't any. Hard to compare that with Supernatural, but I think it would have been better off if the show ended. It has to end. Here's to Season 11 being better then season 10. Although I think season 2-5 are the high point and probably always will be, I'm glad it didn't end there because Swan Song is depressing enough as it is - if the show had ended with Sam in the cage (as I assume it would have without the renewal) that would have been awful! So depressing. And I can't think of a good stopping point since, either - I *hated* the way the arc plot worked out in season six (I have this real problem with the sixth seasons of shows...), the arcs of 7 and 8 were flawed in various ways and I enjoyed 9 but of course it was building up to a cliffhanger, so I wouldn't have wanted it to stop at any of those points. I thought 10 would be the last when I started watching. I'm selfishly glad it wasn't because I'm enjoying watching along with everyone and not in a gigantic binge, but it had to end soon. I'm much more bothered by *how* it ends than when, though. After this long, to get no real closure, or to end on something unutterably depressing (as the ends of seasons 3, 4, 5 or 6 would have been for me) would be incredibly frustrating. A spin-off with Jody and Donna would be so awesome. A next generation type thing with Ben (those memories must be bleeding back a bit in dreams if nothing else) and/or Claire could be good too. Maybe give them an older hunter (Jody!) or angel or something to guide them. I think it will probably take J2 pulling out to end it at this point, though if Carver left that might shake them up, as it takes so long to settle back in after a showrunner change. I think they *should* leave probably, for the sake of their own sanity, it must be exhausting doing a show like this for so long. The spin-off I'd like to see: Eliot Ness, Monster Hunter. Since it's the CW, it would be Ness and his cute 22-year-old sassy partner, and that's fine. Hey! Ness and Dorothy! She's the right time period, right? I agree, that season 4-5 story arc is breathtaking. Nothing later has achieved that cohesion, although every season has its moments of brilliance, and that's why I keep coming back. I think the show will stay on until J & J call it quits, and I'm guessing it will be Jared due to all the stress. I'm still wondering what happened to the third brother, imprisoned in Hell and left there to rot until the CW decides they can focus an entire series on two female superheroes in their 40's. *sigh* You can see my initial comment got taken over by the comments, because I think it's true and I think it's sad! I don't have a problem with Supernatural going on so long. The leads are powerful and carry the show. I do think the writing needs some work. They have too many loose ends that would be nicely and easily used. I stopped watching Supernatural after season 7. I lost interest in it, and at one time it was my favorite show. I guess I just grew out of it. I think it should have ended at season 5. The family aspect of the early seasons had reached its ending. In season 7, the writing started growing stale. The couple of episodes I checked out in season 8 didn't meet up to the high points of early episodes. But, really, I just grew out of it. If others like it, more power to them. I'll watch something else. I also stopped watching for several months after Season 7. I disliked the season, and it did feel stale. Of course, part of that was watching the first 7 seasons in about 6 months... I just finished Season 9 now, and am taking a little break before season ten. I have found - with the last two seasons - that I was getting pretty dissatisfied. Especially season eight, but season 9 seems to have gotten a bit better. something unusual happens... oh no, we don't know what it is - lets scour through the archives... oh look, I found it, we just need some things. Oh, here is a convenient way to get this thing that should be hard to get. And then everything works as planned, or nearly so. Really? With shady books that combine myths and "reality" and half-baked ideas, it just magically seems to happen that they are right almost every time? One of my favorite things about the first few seasons was that the writers were not afraid to have the "worst case scenario" happen, and then the worst of that happen, and it seemed like what they initially tried would almost never work like they expected. But, then they were (usually? often?) able to get out of it in a method that made sense, rather than a deus ex machine (other than an occasional one like a 20 minute night *cough* Bugs *cough*). I hope that the writers will go back to more things 'going wrong' and show our guys thinking on their feet. Even with all the info from the men of letters archives, that doesn't mean that they are right every time. Sorry if this is a bit stream-of-consciousness! I tend to prefer those stories/shows that spool out with a strong arc, and go out on a note that feels like the ending they've been building towards. Limping to the finish line for several years as a shadow of its former self (or something I just enjoy less and less) --- I'm looking at you X-Files) --- isn't the ideal ending I hope for for a show I once loved. So, in my heart of hearts, I wish that Supernatural had ended at the end of its original arc after Season 5. But I can certainly understand why everyone wanted to keep going with it at that point, and I definitely kept watching for several more seasons before finally calling it quits myself. And there were still good elements and stories that I enjoyed in Seasons 6 through 9. But, overall, the show became a process of diminishing returns for me (with some long stretches of straight-up bitter-watching). i watched Supernatural until the middle of the last season. I did not make a conscious decision to stop watching it, but I realized that more and more episodes were piling up on my DVR and I really had no desire to watch them. That might not be fair. There were other shows I wanted to watch more. I loved the first five seasons of this show and that love is what sustained me for nearly another five. But, I just feel that the story had been told and that the arcs are simply being done again and again, with different characters. I've also grown tired with the way the show kills off its great characters. For instance, I feel the show is much less without Bobby. If word came down that next season was the last, I would probably catch up and watch it because I do want to see how they are going to go out. So, I will be one of those former viewers who tunes in for the series finale. Sounds like there are a fair few of us. I always (earlier seasons anyway) thought they should do a spinoff with Hunters in the Old West, starring Samuel Colt. Do we have a finger on the television pulse, or what? The head of the CW just said that as long as the numbers hold and J2 want to do it, Supernatural has "no end in sight". I actually got into Supernatural partly because of all the wonderful things said about it here! The first five seasons (especially 4-5) seemed to be the creative high point for the series, but I've enjoyed a lot of the following seasons. I'm not against the showing continuing in theory, but it seems like we keep retreading the same ground. Over and over and over again. I stopped watching consistently halfway through season 9 because it just all felt the same. Dean goes too far trying to save Sammy and makes everything worse. And Sam is still always doing the "wrong" thing with the best of intentions. It feels like the writer keep growing and regressing the characters at will in order to keep the drama and angst going. Honestly I'd keep watching if they let the characters learn something and grow and CHANGE. I did like season 8 partly because it felt like they were allowing the dynamics between the brothers to change a little (meaning they weren't making the exact same mistakes AGAIN). Dean was trusting Sam to complete the trials, Sam was getting to be Dean's peer instead of his screw-up kid brother and there was some lovely and needed brother bonding and forgiveness at the end of the season. And then they had to reset things and drive an even deeper wedge between them at the beginning of season 9. You couldn't just have the brothers working together to solve a new problem and have some angst come from figuring out how to solve their problem (or even legitimate disagreements about HOW to solve the problem). But no. We had to have one of the brothers betray the other (in a sense) and then we get more of the same brother angst that we've had since the beginning. This ended up being much longer than I intended. Hope that all makes sense. Oh! Meant to sign it. I also have not yet created an account. One day I'll get around to it. I just started the ninth season of the show. I skipped reading the comments for fear of spoilers so I apologize if I'm saying something someone already said. Basically my overall impression of the eighth season was that it was a great season arc, but i was disappointed with the finale. It seemed to me that the writers wrote themselves into a corner where the obvious trajectory would have been for hell to close and/or for Sam to die. Hell closing would have eliminated their primary class of adversary throughout the series, which would have been as weird as vampires completely disappearing from the Buffy universe. The series obviously can't continue without Sam. (They could bring him back to life of course, but that plot device is getting tiresome.) So instead they went in a completely different direction and undid everything they were working on, which left me asking "What was the point of that whole season exactly?" Which brings me back to the original question "Do you think Supernatural should have ended already?" I'm inclined to say no, at least at the point I am in the series. Yes, the length of series has caused the writers to resort to what I consider to be some irritating plot turns, but overall am I still enjoying the series, much of the credit for which goes to the star actors who continue to impress me. Yes, it may have passed it's prime, but that doesn't make it valueless. Because Buffy is my go-to show for comparisons, I would say that seasons 2 and 3 were the prime of Buffy, but I also very much enjoyed season 7 and am glad the series did not end before then for fear of not ending on a high. I do think that they should probably start planning an ending soonish because it's starting to seem like they might be running out of good ideas. My hope is that the series ends with them turning the Men of Letters into a kind of Watchers Council where they train future hunters, allowing them to somewhat exit the dangers of hunting without completely leaving the business and preparing the next generation. I'm going to skip the middle questions because I have no idea. As someone who started the series recently, I can say that the length of the series did not intimidate me. If anything, I prefer it to series that only have one or two seasons where it can feel like it ended just as I was starting to love it. I figured if the quality dropped off, as can happen after 11 seasons, I would stop watching it (although I do feel a weird guilt abandoning shows). I remember when Supernatural began. I thought it would be Charmed in male's clothing. Charmed - a show I thought was good at the beginning, then Shannen Doherty quit, then Julian McMahon, and the show descended into something that must be a world record in downhill decline. Charmed even had the nerve to get renewed instead of Angel back in 2004. Aargh. I've never forgiven the WB for that - and Charmed. They had to axe one show and they axed Angel!! AAArgh again!! So, going into Supernatural I was very sceptical and angry. It turned out that Supernatural wasn't really Charmed after all (though the first couple of eps could easily have been Charmed), and I thought that this is OK-ish. I remember though that I was disappointed with the first season finale. Can't remember why, but I thought that this show won't last long if they keep this poor atorytelling going. And here I am ten years later, still watching Supernatural. I haven't missed one ep. Is it a good show? I don't know. Does it need to be cancelled? I don't know. And that's my problem. I don't really know what Supernatural is to me. I've enjoyed it so far, and I don't have this itching irritating feeling that comes after 10 seasons of shows like Smallville (aaargh! ), X-Files (double-aaargh), that just makes me scream CAN WE HAVE SOME FORWARD STORYTELLING PLEASE!! I just enjoy Supernatural, that's all, and I guess I'll just keep watching. It's been really interesting reading the comments here, a lot of people is referring to the 5th season finale, and that it would have been ok to end it all at that point. I don't remember the 5th season finale so I re-watched it. It was a nice re-watch. And it was a good season finale. But it turns out that I have completely forgotten that Jake Abel was part of this show back then. Would I forget that if I loved Supernatural? No. And I really really like Jake Abel!! So my personal conclusion is that Supernatural and its cast and writers, is Superprofessionals in keeping the show in balance to not overdo anything. Which also means in my case, that I don't really care - but I don't mind!! On a side note - this whole discussion made me re-watch Dark Angel because of Jensen Ackles. He was such a baby back then! And then he went on to Smallville, which I won't re-watch. Period. Even the darkest spell from Rowena won't make me! I'll start by saying that Supernatural is my favorite show, hands down. I discovered it as Season 5 aired, and caught up in time to see Season 6. So I'm glad that Season 5 wasn't the end, because then I would have missed it. And Season 6 is just behind Season 2 as my favorite season. My biggest problem with the seasons afterwards (7 on), is that the writers stopped taking risks. Oh no! Cas is God and power crazed! But only for one episode. Oh no! The Leviathans took over Cas' body! For like five minutes... How cool would it have been if Cas was the head Leviathan? With all of his knowledge about the Winchesters, and the added stakes of not being able to simply kill him, because he's their friend and they care about him. For that matter, how cool would it have been to actually see Dean as a demon, actually acting evil. The writers set up this awesome potential story, and then back out almost immediately. Supernatural's been losing me this last season. For the first time, I didn't watch every episode. (Girls, Girls, Girls, and Hibbing 911). It's not that I'm bored, or I don't care anymore... it's just losing me. I want them to take risks again. I want them to go into a season saying that this will be the last one, and make it fantastic. But I don't think that will happen unless J2 say that they want out. And honestly, the only spinoff that I can see working is if it's set in the past, like with Elliot Ness or maybe following John's adventures with Sam and Dean as kids, or if Sam and Dean are dead and gone for good and it deals with a second generation of hunters, or Jody. I'm personally leaning more towards seeing Sam and Dean's childhood with John, because that's the one show that can actually see being successful on the CW. Especially if Dean is a teen. I forgot to add that I would watch happily. Thanks so much for the excellent comments, everyone. This was our first Sunday discussion post, and you all made it a roaring success. And feel free to continue posting comments. I started watching season 1 last year and am partway through season 8, and may stop here. The logical ending spot would have been season 5, although a total downer ending. I had a lot of trouble getting into season 6, mostly because Soulless Sam's motives were completely inscrutable. It got better late in the season, but I'm totally turned off by post-Purgatory Dean. When Bobby was possessed by a demon and said hateful things, you knew that wasn't really Bobby. When Dean was possessed by a vengeful ghost, it didn't seem like much of a transformation. Apparently there is an episode in season 11 set entirely in the Impala, written by Robbie Thompson. Obviously, I haven't seen it and it might be rubbish, but if it's good, for me that may make season 11 worth it on its own! Count me among those who would have ended it with season 5. Great stories have endings. Although it's continued to be a good show subsequently, if it had ended there, it would have been a truly great show. As it is, the later seasons have cheapened the ending of season 5...so they stopped Armageddon, big whoop, there's another apocalypse around the corner. Actually, I'm struggling to think of any TV show that I think should have continued for more than five seasons. Some (Heroes pops to mind) would have been brilliant if they'd ended after one. I loved this show, and I'm determined to stick with it to bitter end, but in retrospect it would have been better to end it when originally intended at "Swan Song", with the ending tweaked so that everyone who dies stays dead. But at this point I think the only way it'll end is if one of the leads pulls out. As for a spin off, I'd prefer one on Samuel Colt. I feel like it's had two points where it could've ended already, season 5 and season 11, and both of them would've been satisfying endings for the show, but I, personally, didn't want them to end it there. I feel like the quality has stayed reasonably consistent throughout the show's run, and I hope it stays that way through to the end. This is from when I hadn't seen Supernatural, since I got into the fandom very recently. I first saw the season 11 premier as it aired, thought it was cool, watched the first episode with my friend. Was confused about how different Sam looked, thought maybe they'd changed actors or something. Found these reviews, realized it was ten seasons long (at the time), and decided "screw it, I'm gonna watch it all"